This microchipping can be made to sound scary, but the story has two flaws. First, you’re talking about tyranny in the US, not world-wide. The Mark of the Beast will be world-wide, and no matter how well Americans are kept track of, about half of humanity lives in nations that could never afford such a system. Second, the Mark of the Beast will be legal tender world-wide. There’ll be no other form of money for consumers. An implanted chip is too costly, too error-prone, and too problematic: just the risks of allergy and cancer, though rare and unproven, are enough to make it unsuitable for 100% implementation. Moreover, if you disagree with it, even if it’s been forcefully implanted, you can take it out again. Read my free e-book, Walkabout: The History of a Brief Century for a banker’s view of a viable design for the Mark of the Beast! I don’t know about you but 666 is real and it shall happen. i’m not sure if during my lifetime or in the next generation or in thousand of years. what i’m sure of and is believing in is that there’s rapture as well! Christians will be taken in a blink of an eye and those who are left are those who will experience this. besides if it’s starting now I pray that God reveals to his children through the Holy Spirit what it is. if u study out revelation and daniel correctly. u will find that the only church in the world that has the characteristics of revelation 13 is the roman catholic church. the catholics say their mark is sunday worship. at end time if u have (the mark) you will be a sunday worshiper/keeper. saturday is the true sabbath and when all this goes down there are two sides, gods and man. there is already talks in the govt about making a sunday law. but the sad thing is is that the govt is not going to want to do it, the people are going to call for it saying that the country has gotten so bad that we need to turn back to god, thus having a false day of worship set aside. Sunday… revelation is a book of prophesy and u have to study it out correctly to understand what things mean. the bible plainly says 666 is a number of a man VICARIUS FILII DEI (on the popes hat) is interpreted using roman numerals into 666. Well written, well researched story. I’m a Christian but I am not active in any local church. I have my personal beliefs that I carry with me as I go through life that were built from years of attending a Baptist church regularly. To Gregory Greene….have you not noticed that there has been constant chatter of a one-world currency system to possibly be put in place to keep further recessions from creeping up? There are many countries who believe that the US Dollar should no longer be the standard in terms of global currency value. Which makes sense since none of our dollars are backed by anything of value. (Gold, for example). This recession (and trust me…it’s not over yet by a longshot) has allowed other countries to reconsider the US dollar, its value and it’s effects on the world market. One a global currency is in place (not that far off if you believe news reports), you are going to see a global standard. You can already use credit cards globally if you travel internationally…the banking system is tied together seamlessly. It’s only the matter of a quick conversion in terms of currencies to make that happen. I believe the article to be accurate as far as raising sane questions as to what might happen. No man shall know the day or the hour…but you can see the clues given to us by the scriptures and form an educated opinion. But yes, eventually the RFID chip will prove to be the Mark of the Beast because it will be mandatory and will be the only way you can buy or sell if you live in any kind of industrialized nation. Thanks, Don P. for the comment. I have read the posts on the one-world currency, and have responded to some of them. I have a few objections to them: they reflect only a US perspective, and an uninformed one at that; what world leaders are discussing is supplementing the US dollar as an international reserve currency (not as US legal tender) with euros and Special Drawing Rights; the payment media we use–cash, checks, or plastic cards–already work anywhere and don’t depend on introducing a common world-wide retail currency. Neither will a future ID, permanently attached to the bearer, be in any way dependent on the currency in use in a country. You have to be able to travel then, as now; the banks will convert your overseas purchases to your own currency and charge you their customary mark-up just like they do now. You may not realize this, but converting a country to an international currency such as the euro is as laborious as herding cats, and it’ll never succeed in what we know as developing nations. Imagine rooting out every bit of corruption and inefficiency in a place like Zimbabwe so they can present a balance sheet of low inflation, a balanced budget, dependable tax revenue, etc. to an international body overseeing such a currency conversion. It’ll never happen. Ecuador, and in a fashion, Argentina already tried using the US dollar and had to give it up; their economies aren’t solid enough. And the developing world isn’t going away: their fertility is high enough to allow for their high mortality. My book describes the introduction of the Mark of the Beast from a banker’s point of view. As a banker, I can assure you that the Mark, once it becomes legal tender and the only kind of legal tender, won’t be based on a technology as complex and costly as an implanted chip. Why settle for conspiracy theory when you can read the real thing? This is the only “rapture” that is actually noted in revelation, which is AFTER the beasts and the mark (tribulation period). This is reason to take all precautions necessary to be aware of the signs and warnings of any governmental activity that could possibly manifest into the revelation of the apostle John. So does anyone have any insights on whether Revelation is in chronological order? Or am I missing a specific verse? I know that the mark of the beast exists and in my thoughts Nothing will or can make me wnat one. You can torture me you can kill me i dont care but I serve a powerful god and of they do kill me I know I will be going to a far better place.. and I will see my Jesus and I will worship at his feet. Nothing but that matters to me. It says he who worships the beast and his image AND takes the mark….what you are espousing, having a microchip implant in your hand or forehead, does not mean you are worshiping the beast. BOTH conditions must be present to receive the fate described. But a Christian who worships the true God, and has a microchip implanted in his hand, does not fit this category. You people are all the same, first it was a credit card was the mark…now this. Your opinion does not make it so, and I will not starve my family or my children based on even a consensus view of misinterpretation. I trust my Lord and Saviour to indicate to me by his Spirit, who lives in me, the mark when it comes. And I’m not convinced it is as you say. You aren’t my mediator. Christ alone is. And He will not let me be ignorant the day the “mark” is passed out. Semms to me that once that chip is implanted, and you decide to remove it…too late. Just allowing it to be implanted, you’re selling out. Satan has you. No matter if you remove it…you’ve all ready sold your soul, and there is NO turning it around. I would imagine that tons of folks have had that very thought “Oh, I’ll remove it.” Nope… it won’t matter. We’re NOT to take the mark….that’s final. You people are foolish,as you all believe the Beast aka the Man of Sin will obey Satan. I tell you that the Son of Perdition shall not obey Prophecy. God can not force the Lawless One to follow Scriptural Prophecies that foretell of his doom. The Little Horn can and shall DENY Prophecies. Who is able to make the Beast obey Prophecies. God can’t order the Beast to obey Revelations! If you will read Revelations you will see “in your forehead or hand” not on them. What is in your forehead? Your brain. Your brain controles what you do or think and also makes your hand do things it shouldn’t.”Think about it”! On your forehead does not appear until the very last.Then and only then will it be ON YOU. First, the Rapture will happen BEFORE the mark of the beast is initiated. Rev. 4 and 2 Thes. as well as verses in the Old Testament and other verses in the New Testament reveal this to be true. Please remember that God will take His church/bride out of these last days as the times of the gentiles will be over and the Jewish people will be in their last week of 70 weeks predicted in Daniel. Certainly there will be tough times ahead for the church; however, please make it clear to your readers that the Word of God is clear that the Bride of Christ will be removed. You can see Noah and his family as well as Lot and his family as a foreshadowing of removing His people. Study the Word of God! 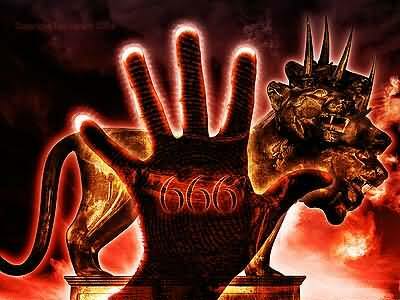 I have come to believe that the Mark of the Beast is the religious affilation that you believe to be true. Forehead is the mind, (the church you believe to be preaching the truth).Whether it be, Baptist, Methodist, Apostolic, Catholic etc. The right hand signifies power. Churches today have power over the congregation. A person wouldn’t be attending a denomination unless they believe what is being taught.The churches that teach certain doctrines have that power, in other words, you will believe what they teach. A person may not believe everything it teaches but overall that person believes most of it or they wouldn’t be attending. I have come to realize that this is the buying and selling… of the Word of God. The Lord has revealed to us that ‘what we have heard’ opposes what He has said. We have heard the anti-christ is coming, but the Lord said ‘even now is already in the world’. So looking to a future anti-christ is contrary to scripture, no ? Doesn’t Islam contend that god has no son ? Isn’t that the definition of the anti-christ per John 2:22 ? I thank God that He kept all the end times pre-post-mid trib worldviews from sinking into my new heart. Not that in my 5 years of faith, I hadn’t heard them all !!! God is not the author of confusion, is he ? We can agree that there is a lot of confusion out there in the ‘church’. How then can the lost be saved, if the ‘church’ can’t agree this very basic tenet ?! Can I suggest a few minutes of your time to read a free download of ‘Islam in the End Times’, at the link below ? The ‘beast’ is refered to as ‘the devil, incarnate’. All humans are ‘born into sin’, that is they are indwelled by the ‘spirit’ of ‘the devil’. This is why evil and sin exists in this world. It makes perfect sense that the carnal ‘spirit’ would seek to create ‘its’ own ‘system’ through carnal human beings, which ‘it’ is doing. That ‘system’ is refered to as the ‘Noosphere’, or the ‘Global Brain’. Those who will not worship the ‘beast’, by becoming a totally integrated into this ‘system’, will be killed by those who do. Total integration, or ‘transformation’, is to be accomplished through the developments in quantum physics, which was called ChaoSatanic Magick Theory, but has now been made into the science called ‘Quantum Theory’, which is taught in nearly every college and university, as well as online. I looked up the words concerning the Mark of the Beast in the Strongs Accordance. Mark- is a badge of servitude. Buy & Sell- To purchase or redeem, to go to market. To be busy, trade. Image- a likeness,profile, resembalance. Beast- destruction, trap.Forehead- Opposite the countenance. Hand- power. Number- as reckoned up. Name- authority,character. Man-nothing,none, nobody. If we look as this is a spiritual mark, not a physical, then many people are being deceived. People will be waiting for some sort of chip, or number to be put on them. When in reality, it is already here and people don’t realize they may have already accepted it. The people in the Bible who gave Jesus trouble was the religious people. Romans 10:2,3 They have a zeal of God,but not according to knowledge.For they being ignorant of Gods righteousness and going about to establish their own righteousness. I have visited many churches and it seems to be this way. There is good and bad people in the churches. The wheat & tares, growing together. If a person is really sincere about serving God they will want the truth. Some may think they are serving God, when in reality, they are SERVING their church and it’s belief. The Bible speaks of many people coming to him and he says he never knew them. Let each of us study to show ourselves approved. a person who is truly seeking the Truth, they will leave the church. Do people believe going to church will save them? It is a personal relationship with Jesus, that will save us. In I Timothy 3:5 & 7 it talks about having a form of godliness but denying the power thereof and also ever learning and never able to come to the knowledge of the truth. Jesus is the only way to Heaven and God the Father. In I Timothy 4:3 it talks about a time that will come when people will not endure sound doctrine and heap to themselves teachers , having itching ears. (4) they will turn away their ears from the truth. Take a look at the churches of today and pray that the Lord will open your eyes to the truth. I was wrapped up in Church, and Thanks be to God, my eyes were opened. Are we not blameless, IF we are saved by grace through faith ? …Do we not continue to sigh and cry over what we see today ??? God has marked us as His OR we could/would NOT be able to ‘see’ what is happening today. FREE download and easy to read “ISLAM IN THE END TIMES’ will help you immensely to clear out the foggy mis-interpretations and doctines of demons out of your spirit !! hello stacy if you are a christian but still put that chip on your right hand or forehead…. you mean … it does not matter to you as long as you dont have the number 666? Is that what you mean? In the last days … there will be deceptions , confusions and destructions. What matters is that .. we have to die to ourselves, be an empty vessels so that the holy spirit can dwell in us and teach us and direct us… it is always my prayer that i will be a dwelling place of God His holy temple… if JESUS is in me… no amount of confusions , deceptions and destructions will come my way. I may be destroyed physically … but my spirit is with my father in heaven thru Jesus Christ my savior and LORD!!! HALLELUIAHHHH… GOD IS VICTORIOUS!!! I don’t believe that microchips are ‘The Mark of the Beast.’ Now I think the person I could compare my belief to is Stacy, call me out of it as you wish. But I don’t think that having a microchip to make my life easier would make me evil. The technology that we have is very advanced, but I don’t think that the government will be able nor would they want to control every single person in the United States, nor in the world for that matter. It amazes me how we have grown as a civilization to attach things we’ve read or, things ‘certain’ people believe in as evil. I don’t feel the need where I must walk around, drive around and constantly feel that everything I’m seeing is evil. Many people believe the word 666 and attach it to what could be a modern world leader. We look in vane for the word 666. 666 does not exist in out modern day. 666 was an emperor that lived long ago. From what I’ve learn the number 666 could be a reference to Greek Emperor Nero. Who was a notorious persecutor of Christians. The numerological equivalent of emperor Nero’s name add up to 666. That story told has nothing to do with us in our present day, but has to do with the Roman period, what was happening at that time, with the Emperors at that time. But people believe and continue to think that the prophecies in Revelations are needed to be believed in our present day and believe everything is evil. When I think about Mark of the beast and religion, I believe in the invention of guns. I could begin to look back in the past, and see believes talking about that as a comment sight of ‘The Mark of The Beast.’ Yet they’re present in our day. For some it makes us evil to own or have them, and for others it makes us feel safe, protecting us from a person that may be trying to take our beautiful life or the life of another away isn’t evil is it? To some it may be, because ‘the after life is so much better.’ To others they may want to enjoy the life they have here. I have 6 numbers in my first name, 6 in my middle, and 6 in my last. Does that make me evil? I’ve been called evil because of it. I have been forced may times to repent of my sins. I have been forced to believe and do things, because “god wants me to.” I am a Realist. I think someone is out there, don’t know who. I’m tired of religions trying to be FORCED, yes FORCED onto me. Most recent Pentecost. But that’s because I made the decision to date a Pentecost ‘believer’ (if you call her that) daughter, even though my girlfriend isn’t which I’m happy about that. I’m tired of being called evil for drinking Monster energy drinks. Because they’re called ‘monster.’ And every downward line on the letter ‘m’ represents a 6 in the hebrew or greek or whatever the heck it is. I’m me. I believe what I want. Call me evil. That’s cool. I’m real. The “Mark of the beast.” That’s not. Oh and the picture at the top is on the left hand. Unless they’re giving a high five er something. But I think it’s backwards. Which further shows my belief. It’s not real. I have read all the above and want to give a little thought of mine. Take the social security number, I do believe when that became mandatory a lot of discussion occurred regarding it being close to the Mark Of the Beast. So now we are assuming the same with the microchip. It is my belief that if I am secure in my relationship with my lord and my heart is pure in his belief that it will not matter when the mark occurs or how because I know where I will spend eternity. But from what I have been taught if our hearts and souls are dedicated, whether we go through this or not as Christians, our God will not abandon us but will carry us through. So I refuse to live this wonderful life blessed to me by worrying about what will come and instead soaking up what is laid before me now. In revelations, those who do not make it through the first resurrection will be locked in the bottomless pit with satan for 1000 years, until judgment. That being said, have you noticed the mark on the Ayatollahs forehead from praying so much, bowing continually on his holy dust? What about all the mass animal deaths as of recent? It is not enough to convince the world but maybe a believer. How blessed are we to receive the signs spoken of in Zephaniah and Luke? Those who do not believe that Jesus was the son of God are antichrist, per the bible. Also, the part about the mark being a world currency, not so specific. It says no man may buy or sell without the mark. That could be a law. Furthermore, when it speaks of the beast, it speaks of his heads being five kings, 3 that are fallen, 1 that is and 1 that will be fallen. Look at the rulers in the middle east. Keep your mind open to possible meanings and fight for your souls, fight for God. Be not sheep to the slaughter; be sheep following the shepherd. Thanks guys the beast is already among us. It appears that many of the postings here do not truly understand the meaning of Prophecy. God makes it very easy to understand if one truly desires to understand. There are some that understand slightly and others that totally miss the mark. Want to know the TRUTH! End Time Prophecy The Antichrist who and what it Truly is! The mysterious Mark revealed. You will know everything you have ever wondered about. The preachers of today say it can not be understood this is false. The meaning is clear you can also trace history and with the information you receive you will have a clear understanding of what God want’s his children to know. I have made it my life’s study for over the past 22 years to understand Revelation then Prophecy in general. As we all dwell on the coming Mark of the Beast, and the persecution of the saints, it is important to live in the Now, that Jesus placed us in, for His purpose. As we wonder of this mark and the persecution to come,Christians in over 50 countries around the world are currently beaten, tortured, imprisoned, raped, and burned out of house and home. The world, in it’s blind hatred of Jesus and those who choose Life over Death, allow the brutality and wholesale murder and persecution of Christians without so much as a peep. While hoards run the streets in the Middle east, proclaiming freedom, their freedom is nothing more than a transfer of power from one Muslim group to another. While they rage on, Christian Arabs are dragged into the streets and brutalized, their homes burned, women raped, children killed. This is the Truth of Current World that no one wants to talk about. These Christian Arabs, and Christains trapped in countries that hate the name of Jesus, are suffering today. Today they need our help. Tomorrow, they will be face down in their own blood. Read ‘Walking In The Light of God’s Greatness,’ to open your eyes to this current tragedy. It is good to hope in Jesus as the Last Days approach us, but to walk with eyes that only look for the beast of Tomorrow, we will miss the beast that roams today, assaulting, and destroying innocent Christians simply because they love and have chosen Jesus as their Savior. These brothers and sisters are our family in Christ and desperately need us now! It is time for us to stand up with them, and Walking In The Light of God’s Greatness, gives simple practical ways that each of us can do this. Let’s leave our denominational arguments behind us, for the theologians to debate, and let us begin to reach out with the hands of love to the very real tragedy afflicting so many believers around the world. These believers are the children of God, in Christ Jesus, and they desperately need our help. It may not be fashionable, but since when should real Christians worry about fashion? New TV program coming on in the near future. The show is titled 666 PARK AVENUE! Its in your face, yet few will admit it! It is the set up for another method of control that ignorant people will gladly accept in return for security. Emanuel is the only true security, not religion or governments.